Simplenet Review 2019: Is Simplenet a Good Hosting? Simplenet offers shared and managed web hosting plans for WordPress, plus WordPress plugins and WordPress optimization solutions. 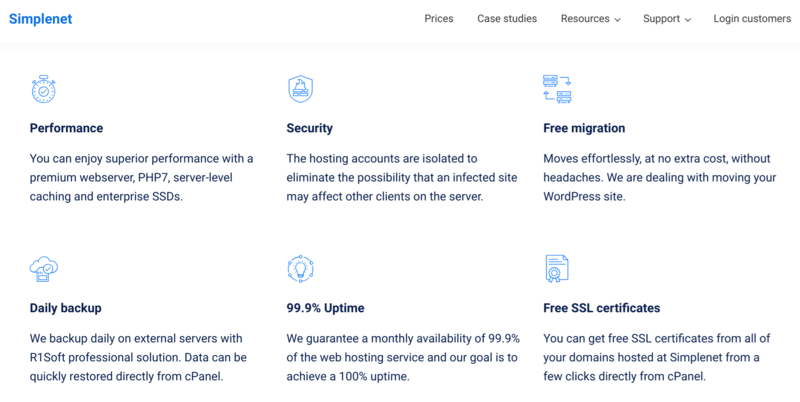 Simplenet is a Romanian company staffed by a small team of specialists who aim to provide medium-sized businesses with specially optimized shared web hosting solutions for WordPress. Simplenet uses the infrastructure of premium Romanian hosting provider Romarg and has servers located in the GTS Telecom data center in Bucharest. Simplenet’s website is in Romanian. Simplenet offers four shared hosting packages, four managed hosting packages, and a selection of other services including domain registration, WordPress migration/optimization, and performance monitoring. With this hosting company you can also look forward to the cPanel control panel, FTP access, remote MySQL, performance statistics, and PHP (5.6 to 7.1). You get easy WordPress installation and optimization, free unlimited WordPress themes, and (on request) installation of WordPress premium plug-ins. This provider’s notable hardware features include RAID 10 disk arrays (for redundancy and performance) and SSDs. The 99.9% uptime guarantee is lower than the industry average. Simplenet’s shared hosting packages are cheaper than the industry average, even when you add on the extra 19% VAT, and you can pay in euros or Romanian leu by bank transfer or credit/debit card. All plans are payable in advance over various periods from monthly to triennially, and you get two months of free hosting for every year you purchase (i.e., six months free on a three-year plan). After placing your order and activating your account, Simplenet gives you a free ten-day test period, after which you can pay the pro forma invoice or just allow the hosting account to close automatically. Existing customers have 14 days to cancel a new plan and claim a refund without justifying the decision. Although the Simplenet support team works from 8 am to 10 pm (excluding public holidays), the emergency intervention team works 24/7. If you’d like to try supporting yourself, you can do so via the well-stocked knowledge base. For competitively priced shared hosting packages that are optimized for WordPress, Simplenet should be on your list. Wondering how Simplenet stacks up against other Web Hosting companies? Enter any other Web Hosting company and we will give you a side-by-side comparison.